Forklift Truck Accident – How Much Compensation Can I Claim? There are around 8,000 forklift truck accidents per year in the UK; the good news is that fatal forklift truck accidents are rare and have decreased a lot over the past few decades. In 1970 there were as many as thirty fatal accidents per year, whilst by 2013 that had fallen to just six. In many incidences, these accidents or deaths could have been prevented. Proper training on forklift truck equipment and usage as well as proper preventative measures could have reduced or eliminated many of these accidents. Forklift trucks are used to lifting and moving heavy pallets, crates, or objects which are either too dangerous or heavy to be lifted by people or smaller mechanical tools. There are risks in operating forklifts and as such employees need to be properly trained in their usage. As with any heavy machinery in the workplace, forklift trucks should be operated with a high degree of care. Workplace forklift truck accidents can happen both to the driver as well as staff and other people in the surrounding operational area. Therefore, anyone working in this area of operation for forklift trucks should take extra care and be trained to avoid falling victim to potential nasty accidents. If you have been injured by a forklift truck due to accident or negligence, you could be entitled to making a no win no fee compensation claim. Whilst we have endeavoured to make this a comprehensive guide, if you still have any questions after reading it we offer free consultation and advice sessions. Contact our expert team if you have any questions relating to forklift truck accidents, claims or relevant legislation. Health & safety and forklift truck accidents. Causes of forklift truck accidents at work. Common types of forklift truck accidents at work. Recording and reporting of accidents at work. Making a forklift truck accident at work compensation claim. 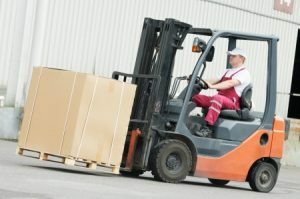 How much compensation could you receive for fork lift truck accident claims. What you need to start your forklift truck accident claim. How long do I have to make a no win no fee claim for an accident at work? A brief guide to making a no-win no-fee claim. Start your forklift accident claim today. Today there are around 8,000 forklift truck accidents per year in the UK;. the good news is that fatal forklift truck accidents are rare and have decreased a lot over the past few decades. In 1970 there were as many as thirty Fatal Accidents per year, whilst by 2013 that had fallen to just six. In many incidences, these accidents or deaths could have been prevented. Proper training on forklift truck equipment and usage as well as proper preventative measures could have reduced or eliminated many of these accidents. The 1974 Health and Safety at Work Act states that it is the responsibility of an employer to ensure that all machinery (such as forklift trucks) used by staff and in the workplace is appropriately maintained, and that all necessary measures have been taken to ensure employees operating the (forklift truck) machinery are protected to a reasonable degree from the risk of accidents. Despite this, the overall number of accidents caused by or related to dangerous machinery (such as forklift trucks) at work has risen. Workplace for truck accidents can be caused by employer negligence, inadequate training, improper use of the machinery or protective equipment, failure to use the correct protective equipment and steps or simply by mechanical fault/ failure. If you have sustained an injury at work due to forklift accidents and our looking for information on making forklift accident claims, this guide has everything you need to have a clear insight into how to register your injury, the compensation you could be entitled to and the steps you will need to take. Where there is a forklift crash or collision with a pedestrian staff member. Where the load has not be properly secured or lifted, resulting in objects falling onto people. FLT accidents resulting from imbalanced loads, resulting in the forklift toppling over and injuring someone. An unseen pedestrian is crushed between the truck and a load or wall etc. This could happen if the driver’s view is obstructed, they are not operating the truck with due care and attention or if the pedestrian has not been trained appropriately. There is a forklift crash with another object or vehicle. Following proper operational as well as health & safety guidelines, there are a plethora of preventative measures which can be carried out. These work to increase overall employee safety around forklift trucks. Common and easy to enact measures include the wearing of high visibility jackets and hard hats. Machinery should be regularly maintained, according to appropriate schedules and standards. There should be regular checks on all parts of the forklift equipment. Any faulty machinery should be identified and repaired before accidents can occur. Your employer should also have a comprehensive liability insurance policy to cover both the business and yourself in case you suffer an accident on their premises. Appropriate liability insurance is required under law. It provides cover to all parties in the event of an accident where compensation, such as forklift accident claims, could be made. The insurance means that if you do make a claim against your employer, the insurance policy will cover your compensation payment. As such, you shouldn’t worry too much about the impact of your claim on the business, your employer will be covered for such an eventuality and you deserve the right amount of compensation to get you back on your feet. These are the most common type of fork lift truck accidents in the workplace. The first thing to remember is that around two thirds of all forklift truck accidents involve someone other than the driver being injured. Anyone working or otherwise in the vicinity of a forklift truck could be placed in danger if they or the driver are not paying due care and attention. Toppling over: uneven surfaces, uneven loads and loads which are too heavy can cause forklifts to topple over. This type of accident can injure the driver and anyone around the vehicle. Obstacles such as potholes, drains and slopes can all cause truck accidents and proper risk assessments need to be carried out. Falling objects: a loose load can fall from the truck and injure passers by. This could cause serious injury to the victim and possibly even death. Loads must always be secured and stable before being moved. Racking failure: if you look online you will probably be able to see lots of videos of racking failing when an object is placed on it. This can be due to poor driving and loading items in the wrong place or lack of maintenance. Another common incident is pushing the load too far onto racking, allowing it to fall off the other side. Collisions: forklifts can collide with other objects such as racking, desks and walls as well as other forklifts, pedestrians and other vehicles. Slips, trips and falls: these types of accidents can often fall under their own type of accident at work claim (see our guide here). Just getting out of a vehicle such as as forklift can sometimes result in injuries such as slips, trips or falls. Employees should be instructed on the correct ways to get into and out of forklift trucks. Speed and dangerous driving: dangerous driving, such as speeding, remains a common cause of accidents for forklifts and fork lift truck drivers as well as those around your workspace. Driving without due care and attention or speeding lead to injuries. Work related and deaths in the workplace. Work related accidents (such as forklift accidents) which cause certain injuries as well as those which result in the worker being incapacitated for more than seven consecutive days. Near miss accidents and other ‘dangerous occurrences’ from a specified list. Injuries to members of the public (resulting in the person being taken directly from the site to hospital) caused by an accident at work. Remember, not all incidents, accidents or injuries need to be reported to an external body. However, employers must record each and every incident that occurs in the company accident book. You can find more information on the types of accident and reporting procedures at the RIDDOR site. Reports to enforcement authorities (except for injuries resulting in more than seven days off) have to be made straight away and by the quickest means possible. They must then be followed up with in ten days of the occurrence with a written notification. Reporting for over seven day injuries need to be sent to the relevant authority within fifteen days. Records need to be kept of all ‘over-three-day injuries’, ie. where a person who is injured at work is then incapacitated (unable to work) for three or more consecutive days. Whilst records should be kept of these injuries, they may not need to be reported. A person is defined as being incapacitated if they are not able to carry out their usual day-to-day work tasks. Your counting period for an over three or over ten day injury periods does not include the day of the accident. It does include weekends and days off/ rest days. Your employer needs to records all workplace incidents. This is so bodies such as the HSE (Health and Safety Executive) and Environmental Health representatives can carry out a thorough risk assessment of the workplace. These bodies are also there so that if something does go wrong and an accident occurs, they can investigate what happened and what went wrong. As such they help to make your workplace safer. Starting a compensation claim for a forklift truck accident at work can be easy to do if you choose the right solicitor and law firm to represent you. You should choose a reputable firm which has expertise in the personal injury sector. To ‘win’ a claim for personal injury or accident at work compensation, you need to be able to prove the accident was the result of negligence on the part of the employer or someone other than yourself. You also need to be able to demonstrate that the accident resulted in you suffering a personal injury of some kind. As a claimant, you may have been the driver or other worker. You could also have been visiting a warehouse or other space where fork lift trucks are in operation. The overall principle is that you will have suffered an injury which is not your fault. Employers and managers have a duty of care to ensure that anyone can move about their premises in a safe way. This duty is to both employees and visitors alike. This includes measures such as keeping forklift truck operating areas separate from other parts of the workspace. If an employer does not do this, they can be held to account by you making a claim against them. Our team of personal injury solicitors have many years of experience dealing with some of the most complicated accident at work cases. They can help with gathering evidence, obtaining the correct medical reports and ensuring that all paperwork is correctly collected and filled out. We will ensure that everything is done by our team to ensure that you can dedicate yourself to rest, relaxation and recuperation. Accidents at work can be extremely serious and we endeavour to provide you with a promise to take care of you and your case. We ensure you receive a hassle free service and are cared for at every step of the way. We cover your and provide our services to you on a no-win no-fee basis. We can start by offering, confidential, free legal advice and consultations. We will assess your case before we both decide whether to proceed and before you sign up to any legal contracts. We ensure you will know the merits of your case and likely outcomes before you go ahead. Deciding which solicitor to go with is the hard work, after this you can sit back. The first thing to do when you have reported your injury in the correct way is to seek the specialist advice and help which can come from discussing your accident with a solicitor. Depending on the severity of your accident and the injury resulting from it, your forklift truck compensation claim could result in a payout of between £3,000 and as much as £25,000 in total compensation. As no two accidents or injuries are the same and estimating your claim damages at an early stage can be difficult. What could look like similar incidents or injuries on paper can be very different in real life. Even the effects of two identical injuries to two different people can be entirely different. Your claim could also be affected by the medical notes and long term prognosis from the attending physician. Until all the evidence has been collected, we can’t realistically estimate how much you could be awarded. Below is a table of compensation amounts compiled from historical cases. Basic personal information such as your name, proof of address, date of birth, etc. Information about the accident itself. The circumstances which lead to or caused the accident as other information on your workplace such as practices. Details about where and when the incident occurred. Information on the injury. What type of injury did you sustain and how serious was it. Do you already have medical notes from any examinations ? The name and contact details of the company you work for or employer. Medical information. Notes from any EMT’s, local hospitals or GP’s. Proof of earnings if you had to take time off.Incident details – time and location. How long do I have to make a no win no fee claim for a forklift truck accident at work? There are time limits for bringing your forklift accident compensation case for personal injury at work. The typical time limit is within three years. Often if you have not made a claim within this time and if you have not brought any initial proceedings, your claim with almost always be invalid. There are some exceptions to this. 1. If you (the claimant) is or has suffered from any mental health conditions, then you have an additional three years from when you have made a full clinical recovery to start initial proceedings. If you were suffering from a mental health condition at the time of your accident, then the three year time limit won’t start until you are completely back to health and have been declared ‘normal’. 2. The consequences of personal injury won’t always surface or be obvious straight away. There have been cases of people not being aware that they have even suffered an illness or injury until sometime much later. There are thus exceptions for these cases. The time limit won’t start until you have become aware of the illness or injury. 3. If you as the claimant is likely to suffer mental illness for the rest of your life, there is no time limit on when a claim can be made. You have the right to bring a claim at any point in the future. You will probably have seen a lot of adverts on TV and in the papers for ‘no win’ ‘no fee’ services helping you to make a claim without having to pay for services up front. It also means that if you are not awarded anything, you won’t have to pay anything. No win, no fee agreements are also known as conditional fee agreements. They are an arrangement which you make with your solicitor helping you to claim compensation, without having worry about paying legal fees up front. If and when your claim is not successful the agreement will state you won’t have to pay anything back to your solicitor. Only paying for the legal services in the event of a win removes the risk from making an personal injury or accident at work claim. If you lose your case you don’t have to pay out of pocket up front. There are also no hidden charges in these agreements, meaning you know exactly what you are signing up to. Making a no win no fee agreement is subject to the solicitor taking on your case, and there are some exceptions or cases in which a solicitor won’t be able to go ahead with this type of agreement. We have developed a no win no fee service which is aimed at helping anyone who needs help to get their claim heard, with access to appropriate legal representation. It doesn’t matter whether or not you have the funds to cover the legal costs, you should not be put off making a claim just because of your financial situation. Find more information on why our no win no fee services could be right for you here. If you have had a personal injury or accident at work which was not your fault or resulted from someone else’s negligence, get in contact with our team of specialist workplace accident or personal injury claims solicitors today. Our team will check through your case and let you know whether or not you have a good case for making a claim for compensation. Even if you think that the accident which lead to your injury was not the direct result of someone else’s actions or negligence, you may still have a case to make against your employer. We will put you in contact with one of our solicitors to provide you with expert legal advice for free. We’ll get all the facts together and take a look over it before deciding on whether or not to proceed. We can discuss with you whether you have a good chance of making a successful claim accident at work compensation. Using our no win, no fee agreement, you won’t need to pay so much as a penny in up front fees. Pick up the phone and talk to our expert team today. If you have suffered from an accident at work find out how much compensation you could claim. Information on the safety of lift trucks from the HSE website.